There were 692 press releases posted in the last 24 hours and 153,590 in the last 365 days. 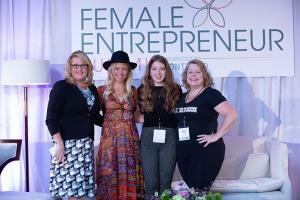 Anne Richie, Venture Partner at JumpStart Inc.
CLEVELAND, OHIO, UNITED STATES, November 1, 2018 /EINPresswire.com/ -- The 2018 Female Entrepreneur Summit brought together nearly 300 Northeast Ohio women entrepreneurs and business leaders for a day of learning, inspiration and networking. Now in its 7th year, the summit allowed attendees to engage with successful entrepreneurs, business leaders, dynamic speakers and experts who shared resources, opportunities and personal testimonials. Additionally, the new FES Investment Fund to benefit Northeast Ohio female entrepreneurs was announced to the group. Held at the 700 Beta Drive Conference Center in Mayfield Village, the Female Entrepreneur Summit kicked off with keynote speaker, Eleanor Beaton, an acclaimed women’s leadership development expert and host of the podcast “Fierce Feminine Leadership,” who not only inspired, but equipped the audience with tips and tactics about how to think like the top 2% of female entrepreneurs. Throughout the day, attendees listened to more than 20 successful entrepreneurs offer practical insights, honest advice and proven tactics designed to help their companies grow and thrive. Highlights included breakout sessions, a lunchtime panel discussion and wine tasting with three female winemakers/entrepreneurs, various networking opportunities, a Sponsor Showcase and a drawing for valuable door prizes. FES Investment Fund Launched: Another highlight of the day included a major announcement from Renée DeLuca Dolan, whose company, Contempo Design + Communications founded and hosts the annual summit. 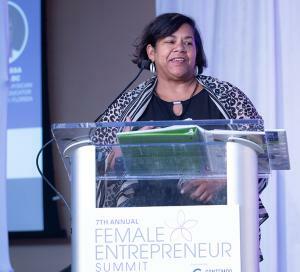 DeLuca Dolan officially launched the newly created FES Investment Fund, specifically created by women to support female entrepreneurs in Northeast Ohio, which she described as an underserved population without easy access to funding. “Data shows that women entrepreneurs get more funding when the investors are also women. That’s why it is so exciting to see these investors stepping up,” said Anne Richie, Venture Partner at JumpStart Inc., a Cleveland-based non-profit venture development organization advising DeLuca Dolan on the creation of the fund. “It is also important to note that this fund will provide flexible debt capital with an ability to convert to equity. This type of flexibility is essential for business owners with ambitious growth plans but limited access to capital,” said Richie. The current investment team is comprised of DeLuca Dolan, graduate of Cohort 13, Cleveland, Goldman Sachs 10,000 Small Businesses program; Amy Jenyk, Cohort 17, Cleveland; Donna Heffernan, Cohort 13, Cleveland; and Dr. Venessa Walker, DC, Cohort 8, Miami, Fla. The fund requires a minimum $5,000 investment from each investor. DeLuca Dolan noted that the fund will be awarded to one or more companies selected by the investors through a Shark Tank-style pitch event, the date of which will be announced soon. To learn more about the FES Investment Fund, please visit www.contempocleveland.com/fes. About Contempo Design + Communications: Since its inception in 1996, DeLuca Dolan’s Contempo Design + Communications has helped Northeast Ohio businesses and organizations reach their marketing and branding objectives through the creation of memorable logos and identification materials, dynamic websites, interior spaces and experiences. The company serves as the official design partner of the Cleveland Indians. 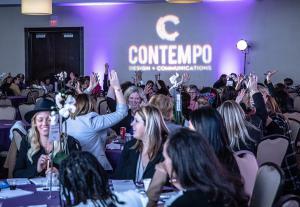 About the Female Entrepreneurs Summit: Now in its seventh year, Contempo’s FES is regarded as Cleveland’s signature event for female business leaders to connect, learn and grow. This year’s event took place on October 24 at Beta Conference Center and was emceed by WKYC reporter Monica Robins. 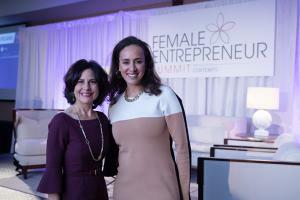 The summit featured more than 20 successful industry professionals, including keynote speaker Eleanor Beaton. Beaton is a women’s leadership expert and host of the podcast, “Fierce Feminine Leadership.” The summit also included breakout sessions, a lunchtime panel discussion and wine tasting with three female winemakers/entrepreneurs, networking opportunities at a Sponsor Showcase and a drawing for valuable door prizes. or contact Stacey Vaselaney at 216-905-0908 or slvaselaney@slvpr.com.